Once I got Ben figured out, I started looking at my lotions and bath products. Vaseline, Olay, Body Shop. Good grief. Not pretty EWG scores or ingredients. Like, really a scary amount of toxins that could lead to serious serious stuff. So I kept on with my living clean mission. One of the best places to start is with body lotions because your body absorbs SO much of it. I use body lotion head to toe daily, so it was my first priority, and I had to find some better options. SO. First stop, Badger again! I know, I know, this is starting to look like a Badger commercial. (Promise that other products will be mentioned, many others!) I wanted to see a lot of zeros on EWG, and I had to find things that I could get easily that weren't going to cost me a million dollars, and that didn't smell like hippies. Again, sorry hippies, I'm one of you now! But, after comparing many products out there against Badger, they just couldn't be beat. And now that I've been using it, I LOOOOOVE their whole product line. Badger Rose Geranium Soap - EWG Rating 0 - Doesn't dry your skin at all. I think people shy away from bar soaps but they are the BEST as long as you get a good one, and I love this one so much. My face soap was Dove Unscented for YEARS and I never thought I would find one I liked as much, until this one. I actually am not usually into anything that's rose-smelling, but this smells like heaven. Badger Damascus Rose Antioxidant Oil - EWG Rating 0 - Use this at night like a moisturizer. If you're not used to oils it probably seems weird, but it's much better for your skin than any lotion (which is just loaded with water that evaporates, making you feel the need to reapply). If you're nervous, try using it at night only and see what you think. If you do a bit of research you'll see that many people love the switch, including people with oily, acne prone skin. I use one little squirt of this then apply lightly to my face and neck, and my skin drinks it right up. Badger SPF 16 Rose Face Oil - EWG Rating 1 - This is your new day lotion, which is much more lotion-y than the antioxidant oil and is so great on the skin. Daily SPFs (and all sunscreens, actually) have this sort of gross chemical smell that has always bothered me (even long before I knew about the dangers of those chemicals), but not this one. It's a safe, nutrient packed oil that is AMAZING for your skin! Badger Damascus Rose Beauty Balm - EWG Rating 2 - Perfect as an eye cream or for a deep moisterizing treatment now and then. Badger Vanilla Orchid Antioxident Body Oil - EWG Rating 1 - So heavenly. Absorbs very quickly, and makes skin feel so soft. LOVE this. Next time I order some Badger stuff I'm going to go with the rose option for the essential oils that fragrance this body oil. I went with this one to give me some variety (and just in case I wasn't into the rose smell that was already in so much of the other products) but it turns out that the rose scent is much nicer than I thought it would be, and I'm hooked. But this one is lovely too. Badger Vanilla Coconut Everyday Moisturizer - EWG Rating 0 - perfect to keep in your bag for your hands. Such a cute little tin too! Badger Lip Balm - EWG rating 0 - I loved this little four pack, because I need to have lip balms everywhere. I used to keep Lipsmackers all over the place. EWG Rates them between 4 and 7. YIKES! Never again!!! 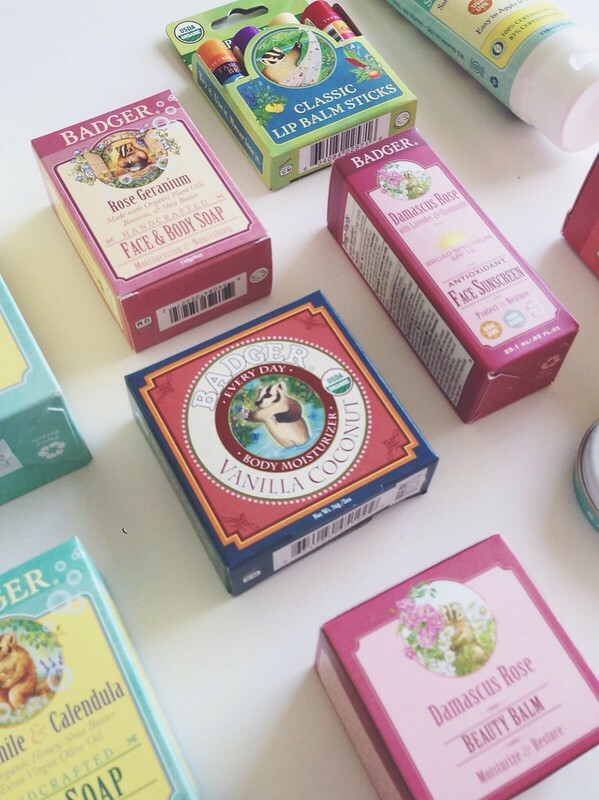 These balms are perfect and they really soften your lips. One of the first all natural things that I picked up that has now become a daily staple is Nutiva Organic Coconut Oil. I'm about four years late to the Coconut Oil party but luckily I discovered it now. This stuff is incredible! I've used it as a full body lotion, a face lotion, a defrizzer, for little dry patches on Ben...the list goes on. I'll never be without it again! I'm still very into homemade beauty products...I've been using a homemade toner that I'm still perfecting, which I'll be sure to share here once it's ready! I'm also planning on making a really great foot balm and more spa type treatments. Fun!! Ok, let's move on to hair. It's easy to think that hair doesn't really matter because it's 'dead' and doesn't really absorb shampoo, so why does it matter? Well, your scalp is very porous, so that shampoo is soaking right into it. And in the broader, greener sense of things, chemical-filled shampoo is being washed down the drain and ends up in our drinking water and oceans. So ya. It matters. I remember buying organic shampoo years ago on the suggestion of someone and I HATED IT. It smelled like oregano and it didn't lather and I cried tears of joy when I washed the smell out with my trusted Herbal Essences Coconuty smelling shampoo. Well, times have really changed and the options are so much better!!! Hugo Naturals Smoothing and Defining Coconut Shampoo and Conditioner - EWG Rating 0 - YUM. This smells awesome. And it's sudsy and wonderful. I'll never go back. The whole Hugo line is great so take a look and see which one is best for your hair type. As far as stylers go, I'm still on the hunt for a natural hairspray. This is proving to be the most tough search. If anyone knows of any, please let me know! Deodorant was a tough one. A lot of them are awful. Tom's makes a nice smelling one (Long Lasting Beautiful Earth), but after a couple of weeks it started to irritate my skin, and I didn't find it to be all that long lasting. I'm going to try Soapwalla, which might seem strange to some as it's a lotion, but to me it seems quite decadent and feminine compared to the usual sticks. Not to mention it gets a 0 on EWG and people RAVE about this, it has a total cult following. I also love Hugo Natural's Vanilla and Sweet Orange Essential Mist (EWG Rating 0) as a very light fragrance for everyday. Ok, what's left? Oh. TEETH. We use Tom's Whole Care Flouride Toothpaste. I'm nervous to go flouride-free, though there seems to be many reason's to do just that. I'm still at the beginning of this whole journey, so I'll have to do more research on that topic for sure. I brought this copy home from the library the other day and devoured it. 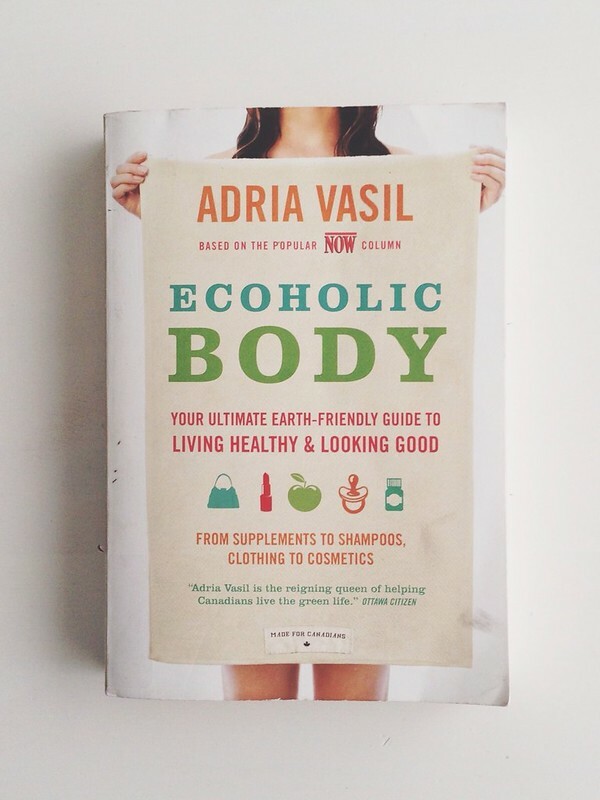 Next on my reading list are Ecoholic Home and the original Ecoholic. Next up in this series...makeup! That wonderful wonderful coconut stuff you gave me is out of this world. I use it on my skin and, as you suggested, in my hair. No frizz! So glad you mentioned the coconut oil, I forgot to mention it originally!!! Isn't it the best? I just realized Badger doesn't ship to Canada...how did you place an order?? I did a bunch of research for sites that ship Badger products to Canada. iHerb.com has a $10.00 shipping rate for Canadian (and international) customers on orders over $60 (plus tracking), you also get 5% off your order if you are spending over $60 and 1st time customers get $10 off! I ended up saving $15!! They also have discounted prices on a bunch of Badger products! I ordered 8 badger products and my total was $90, much cheaper than other sites I looked at! They have (from what I can tell) their whole product line! That's so amazing!!! Have you received your products yet? Do you love them? I'm so addicted to the lipbalms and the hand balm, it's the best!! !